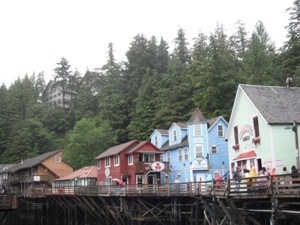 At our first stop in Ketchikan, I chose to go snorkeling, probably mostly so I could say I did. Well, I did! 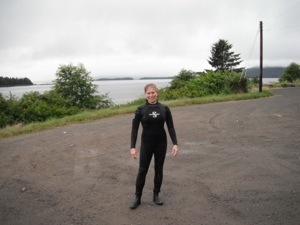 The water was about 60 degrees, and we wore 7mm wetsuits with hoods and booties and gloves. A warm current comes in from around Japan, so the water’s not as cold as you might think. But I was ready to get out and drink hot chocolate by the end. There was a lot of kelp, just like southern California, as well as sea stars, sea sunflowers (they have more legs), sea cucumbers, sea urchins and jellies. I also saw a rock fish blending in to the rocks and a small orange eel. We spent an hour paddling around the coast line, with our guides stopping periodically to pull up some animals, tell us about them and pass them around. They were very knowledgeable, and it was also interesting to hear about their seasonal work. One of the guides was from the Chicago area, but now spends most of his time as a dive guide in warmer climates. This was his first season in Alaska. 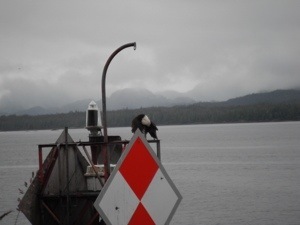 We also saw several bald eagles around the shore. 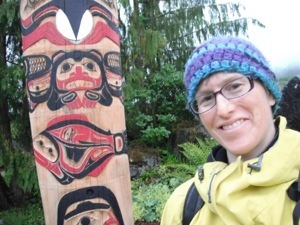 Later, I wandered around the Creek Walk, which was a raised boardwalk along the river. It used to be the red light district, but now is filled with tourist shops and small exhibits. at the top of the hill. It’s like a cross between an elevator and a tram car. 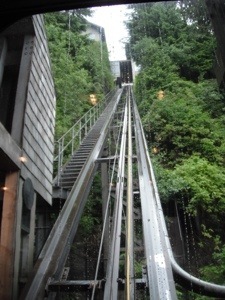 Of course I paid my $2 so I could say I have ridden a funicular!